Butler Home Improvement, the owner of Sunspace of Greater St. Louis is excited to provide St. Louis residents with incredible sunroom options! As the only Sunspace® branded dealer in the area, Butler has exclusive sunroom options that no other sunroom contracting company can match! Are you ready to impress your friends and family with an incredible sunroom? Sunspace Sunrooms are an incredible part of any home. They allow sunlight and the natural colors of the outside world in, while keeping harsh temperatures and dirt/dust out. When you are ready to enjoy the serenity of the outside world without leaving the comforts of your home, then you are ready for an incredible Sunspace® sunroom. Sunrooms are all about comfort and what you are comfortable with. But what type of Sunspace® would best fit your family’s lifestyle? Do you cherish the sensations of a spring breeze dancing across your skin while breathing in the scents of the flowers and trees as they bloom around you? Then a screen room might be your best choice. Do you like to watch the green of summer grow across your backyard, and then months later watch as the leaves turn vibrant shades of red and orange, all while without feeling the fiery bite of summer or the cool chills of fall? A sunroom may be your best. Do you want to relax in a climate controlled oasis that will keep you warm as the snow falls, and cool when the summers get just a little too hot? Then a 3-season or 4-season Sunroom may be the choice for you. Whichever sunroom you choose, you are making an incredible investment in the aesthetic and feel of your home. Having a comfortable outdoor getaway gives you and your family another space in your home to enjoy, while also bringing the serenity and beauty of the outside world to your backyard at a level you are comfortable with. You want to enjoy the comforts of Sunspace® Sunroom, but you aren’t sure where to begin or what exactly you want. You may even question if you know how to properly design a sunroom so that is fully functional and comfortable. Don’t worry, we can help you with any design ideas you may have, and can answer all questions regarding sunrooms. Watch this video for more information! Screen Rooms give you and your family and friends the comfort of relaxing and enjoying your outside space, without the annoyances of bugs, messy pets, or inclement weather. Screen Rooms are the first option of Sunspace® Sunrooms that Butler is proud to offer. Theese screen rooms are highly customizable, and offer stylish design options that include full ventitlation, different screen types, and can be easily installed onto an existing porch or deck. As an added bonus, Model 100’s can be easily upgraded to the Model 200’s. Enjoy your outdoor space within the comfort of a Sunspace® Screen Room! Model 200 Sunrooms are one of our most popular options because of their versititlity and that they boast WeatherMaster Vertical 4-Track Vinyl Windows which are made exclusively by Sunspace®. Model 200’s are modular units that combine the best features of a screen room with the added bonus of being entirely enclosed. These models also use View Flex Vinyl Glazing, which is stronger than glass, but yet light enough to manuever around, stack up, down, or bunch in the middle. Model 200 Sunrooms are an incredible option when you need more than a screen between you and the outside weather. These models come in a variety of colors and customizable options that allow you to make your sunroom uniquely yours. These are custom designed to offer an open air feel if the windows are open, yet allows you to close the windows to keep out pollen, mosquitos and harsh weather. The windows are more durable than glass. They are available in multiple tints (at no additional cost). They control sunlight and allow you to have the option of 75% ventilation. The Model 200 Sunroom from Sunspaceface offers flexible designs, a wide variety of color and customization options to suit your home and an economical way to expand the functionality of any space while adding style and increased value. 3 Season Sunrooms bring the dynamic colors and character of nature to the comfort of your own living space without any of the drawbacks. Model 300’s boast insulated aluminum pillars, single glazed glass windows, the Sunspace® Roof System with integrated gutters and have a durable almost maintenece free exterior that allows you the maximum amount of time and enjoyment with your outdoor space. The models can be custom designed to fit any living space or existing outdoor structure, whether it be a deck, porch, carport, or even a cabana. When you are ready to extend the seasons to fit your needs, invest in a Sunspace® Sunroom Model 300. 4 Season Sunrooms are customized around comfort. When you want to enjoy the beauty of nature in all of its majesty without suffering through the heat of summer or the bite of winter, a Sunspace® 4-Season Sunroom is exactly what you need. These insulated sunrooms have double-glazed high-efficiency low e-argon glass windows that come with extrusions with commercial grade combine, and are combined with the Sunspace® Thermal Roof System to provide your sunroom with the maximum level of support and comfort through any snow storm, heavy rain, or the sweltering heat of summer. These additions can also be paired with Therma-Deck flooring, which is ideal for carpet, tile, or any other type of flooring and provides 25% more insulation than conventional flooring constructions. When you want the maximum amount of comfort within your outdoor oasis, choose a Model 400 Sunroom. 4 Season Sunroom: This is a room that customers can enjoy all year round. This is an all weather room which has heating/air conditioning included. Double glazed high efficiency, Low E-Argon gas Glass Windows and extrusions with commercial grade thermal breaks combine with the Sunspace Thermal Roof System to provide strong support for wind and snow load while reducing condensation and heat loss. When you are ready to enjoy the incredible comforts that a Sunspace® Sunroom can offer, Butler Home Improvement can help. We are proud to offer our Sunroom Design Services to the Greater St. Louis area and Metro East Illinois. When you need an incredible outdoor living space that has the comforts of a home, call or contact Butler Home Improvement to get your Sunspace® Sunroom. What a wonderful job on our porch. We love our new three seasons room and couldn’t be happier with how it turned out. You made the whole process easy and enjoyable. The construction crew was top-notch and paid attention to every detail. We would highly recommend your company to anyone wanting a new porch or sunroom. Thanks again. What is the Average Price of a Sunroom? Our biggest seller is the 3 Season Sunroom with WeatherMaster Vertical 4 Track Windows. The most common average size is a 12×12; however, we customize our rooms for every customer. Our Sunrooms are customized for every project. It’s not just the size of the room that we have to consider. We also have to look at how we will attach the room to the home. Will we tie into the fascia? Will we need to tie into the roof due to height of the room? What is the sunroom to be installed on top of? Meaning, does the customer have a concrete pad/patio? OR do they have a deck that we are putting the room on? If they do have either of these structures, are they built to hold the room? Does the structure need to be updated to pass code? Are the piers installed correctly to pass code? Does the customer need a new sub structure? These are questions that we have to have answered before we can provide you with an honest estimate for pricing and labor. What Type of Warranties are Included with the Sunrooms? Sunspace Modular Enclosures Inc., (the manufacturer), guarantees the materials factory workmanship, the original purchaser, to be of excellent quality as provided in this limited non–prorated warranty. Laminations and Finishes –Lifetime Warranty All expanded polystyrene panel products are warranted to be free of blistering, chipping, cracking, peeling or delamination under normal residential use and service for as long as you own your sunroom. Vinyl Extruded Components –Lifetime Warranty Sunspace warrants its vinyl extruded components under normal residential use and service, to be free from peeling, flaking, blistering and corroding for as long as you own your sunroom. The vinyl extruded components are not warranted against discoloration caused by air pollution, exposure to harmful chemicals or normal weathering (fading) resulting from exposure to the elements. Hardware and Screen Units –Lifetime Warranty Sunspace warrants the materials used for moving parts (Door Rollers, Latches, Etc. ), and other hardware items and screen units under normal residential use and service for as long as you own your sunroom. Glass windows in our Sunspace Sunrooms – Manufacturer Sunroom 4 Season Rooms: Insulating Glass Units -15 Year Warranty Sunspace warrants its insulated glass units for fifteen (15) years, from the date of installation, under normal residential use and service, against seal failure resulting in permanent fogging in the space between the glass. Window & Door Glass Breakage –Lifetime Warranty Sunspace warrants its tempered glass units in windows and doors against breakage in residential use for as long as you own your sunroom. Vinyl Windows are those used in our 3 Season Room. They are called WeatherMaster Vertical 4 Tracks or Horizontals: Vinyl Glazed Windows -10 Year Warranty Sunspace warrants the vinyl glazed windows for ten (10) years, from date of installation, under normal residential use and service, against fading and cracking provided the cleaning instructions are followed. Taking Care of Your Vinyl Windows. Please remember vinyl is not glass. Extreme care must be taken when cleaning your vinyl windows. Do not use any harsh cleaners or detergents. It is imperative that formulas containing bleach or ammonia are NOT used. For best results, your windows need to be cool before washing. Make sure all dust and loose sand or grit has been removed from all areas of the frame. We recommend that you use our vinyl cleaner which has been specially formulated for your windows. You may purchase this cleaner from your Sunspace Dealer. They can also come with integrated railings. We offer screen doors as well. What is the Average Size of a Sunroom? Average size sunroom: 12 x 12. Our sunrooms are custom and we are happy to be able to provide our customers with an amazing room regardless of the size wanted/needed to exceed the customers dream room. What are the Benefits of Purchasing a Sunroom? You Enjoy being outside without bugs, harsh weather, noise. They give you the comfort of an inside room, but you are also given the chance to enjoy views that you typically wouldn’t get to enjoy. Enclose hot tubs for privacy as well as keep out the bugs and harsh weather. Sunrooms give you the opportunity to entertain friends and family regardless of the weather. You can use the new additional space as an incredible home office. You can turn the sunroom into an excerise room to enjoy the outdoors while being healthy. They are the perfect place for family gatherings and quite areas for relaxation. Animals love sunrooms – they get to look outside all day. Green house – great for plants. Is there Financing for Sunrooms? 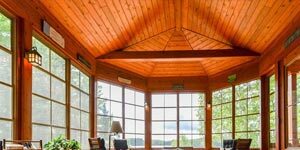 How to budget for a sunroom: We offer several financing options to our customers. Call or contact our Sunroom Experts now for the financing details. What are the Sunroom Roof Options? Sunroom roof options: We can customize a roof to match your home, we can build a gable roof or shed style roof. We can install a modular roof as well. Either way, we can also install shingles to your roof to allow it to match your home. Modular Sunroom versus Custom Built Sunroom. Both sunroom options are great! Some customers want the room built to match their home so that it doesn’t look like an add on. This would then fall into the custom built sunroom. Some customers want our Sunspace Modular Sunroom option. They are very nice and are custom made. Some ask what is the most cost effective. The custom built roof will cost more in labor as it takes longer to build this type of room. The modular roof will cost more in materials; however, the labor and install is much faster as it is built at the manufacturing plant. What kind of Design flexibility is there? What kind of Design flexibility is there? All of our rooms are custom made to suit our clients needs for their home or property. We want everyone of our clients to have the exact room they desire so that they can enjoy it for years to come. Regardless of what our customer dreams of, we can build it to fit their taste and lifestyle. Will your product match the theme of my home? Our rooms are custom made and we offer several color options. We can also custom build the room to match the home so that it fits perfectly with any existing styles. Are you able to work within my current space? Are you able to work within my current space? We are specialists in “re-purposing” space. Complete custom fabrication to the 1/8″. All projects are different, so it is hard to say how long. You also have to determine the time to order/receive products as well as weather. Can you enclose my existing patio? Can you enclose my existing patio? Yes, our sunrooms can be installed onto an existing deck or patio. We can also install under an existing patio cover or roof. We do this a lot as customers may have an existing patio or deck. They want a sunroom because they enjoy being outside, but the intense sun/mosquitos/rain keep them from enjoying being outside. If they have a patio roof already, but no patio or deck… we can build those as well. So, if they have a roof and platform – we can accommodate their wants. If they don’t, but want a complete sunroom – we can do this as well. The options are endless. We enclose outdoor patios to allow restaurants and other commercial properties to provide outdoor seating for their customers. This allows for: Customers to enjoy being outside without harsh weather, intense sun, bugs, rain, loud noises from the road. It allows the business owner to offer this to their customers which a lot of times, it attracts more customers. It also provides more revenue to restaurants who could increase profits if they have more seating for customers. An example: The Retreat Gastropub has our enclosure. They are limited on their indoor seating. We enclosed their outdoor patio and they were able to increase their seating area year round. They installed some outdoor heaters to allow year round outdoor seating. They also can open or even remove the light weight windows on nice days to allow for a full outdoor patio experience.